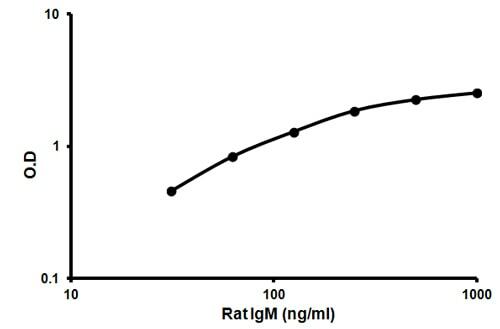 Abcam’s IgM Rat ELISA kit is an in vitro enzyme-linked immunosorbent assay (ELISA) for the quantitative measurement of IgM in rat serum and plasma samples. In this assay the IgM present in samples reacts with the anti-IgM antibodies which have been adsorbed to the surface of polystyrene microtiter wells. After the removal of unbound proteins by washing, anti-IgM antibodies conjugated with horseradish peroxidase (HRP) are added. These enzyme-labeled antibodies form complexes with the previously bound IgM. Following another washing step, the enzyme bound to the immunosorbent is assayed by the addition of a chromo­genic substrate, 3,3’,5,5’-tetramethylbenzidine (TMB). The quantity of bound enzyme varies directly with the concentration of IgM in the sample tested; thus, the absorbance, at 450 nm, is a measure of the concentration of IgM in the test sample. The quantity of IgM in the test sample can be interpolated from the standard curve constructed from the standards, and corrected for sample dilution. IgM normally constitutes about 10% of serum immunoglobulins. IgM antibody is prominent in early immune responses to most antigens and predominates in certain antibody responses such as 'natural' blood group antibodies. IgM (with IgD) is the major immunoglobulin expressed on the surface of B cells. The gene for the mu constant region contains four domains separated by short intervening sequences. Class specific anti immunoglobulin antibodies are useful for: The characterization of malignant B cell proliferations. All but acute lymphocytic leukemias share either surface or intra cytoplasmic Ig with an isotypic restriction, which suggest the monoclonal nature of the cell population. Most of the chronic lymphocytic leukemias, non Hodgkin lymphomas and Burkitt's lymphoma bear surface IgM, whereas plasmocytes from Waldenström's disease bear intracytoplasmic IgM. The other isotypes are less frequently found. On the other hand multiple myelomas are usually of the IgG or IgA type. Characterization of plasma cells in inflammatory conditions: Plasma cell typing can be of use for the classification of intestinal inflammatory conditions such as inflammatory bowel disease and allergic conditions. In the latter a specific increase in the number of IgE plasma cells can be demonstrated. Our Abpromise guarantee covers the use of ab157738 in the following tested applications. Representative standard curve using ab157738 IgM Rat ELISA Kit. Publishing research using ab157738? Please let us know so that we can cite the reference in this datasheet. There are currently no Customer reviews or Questions for ab157738.